It isn’t very difficult to get me to try just about any pumpkin themed food or drink. In fact, from the months of September to November I’m pretty much obsessed with all things pumpkin! Fall is coming to an end, but it’s not too late to enjoy this favorite fall food. Not only is pumpkin festive and delicious, but it’s a great source of multiple nutrients including vitamin C, vitamin E, potassium, magnesium, fiber, and beta-carotene, which is responsible for the bright orange color. Beta-carotene is a carotenoid, a type of phytonutrient (i.e. a nonvitamin, nonmineral compound in food that provides health benefits) which acts as an antioxidant in the body. Carotenoids are believed to promote health and fight disease, and have been linked to a decreased risk of some types of cancers. Not a pumpkin fan? 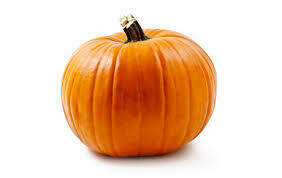 Butternut squash, acorn squash, and sweet potatoes are also a good source of these nutrients. Pumpkin seeds are also nutritious, packed with minerals such as magnesium, iron, copper, and zinc, so don’t throw them away when carving pumpkins! Instead, try roasting the seeds at 350°F for 20 minutes and lightly salt. They can be eaten plain, tossed on top of a salad or for a unique snack try mixing them with other assorted nuts, dried fruit, and/or dark chocolate bits to create your own trail mix. You don’t have to cook your own pumpkin to get the health benefits either. Canned pumpkin puree (not to be confused with pumpkin pie mix which has added sugar) is just as healthy and easy to incorporate into baked goods, soups, and oatmeal. Try the recipe below for a healthy and hearty breakfast or snack. Cook the oatmeal according to package directions. Be sure not to make it too watery since you’ll be adding milk to it. Add cooked oatmeal and all other ingredients to a saucepan and simmer for 5 minutes. Enjoy. Bonus recipe! It doesn’t technically have pumpkin in it but is still great on cool fall or winter days. Pre-cook sweet potato in the microwave for 3-5 minutes, peel, then cube. Sauté the onion in a pan with 1 TBSP olive oil. Add ground turkey and sauté until cooked. Add turkey/onion mixture and all other ingredients except for the beer to a large pot and bring to a boil. Reduce to a simmer. Add beer if desired. Simmer for approximately 25 minutes. Top with crushed sweet potato chips if desired.